· From Mexico City 627 22 728 options 7 and 6. · From the rest of the country 01 55 627 22 728 options 7 and 6. · From the United States of America and Canada 1 8 77 44 88 728 options 7 and 6. The process is very complicated. Due to an accident the vehicle is a total loss. This is the summary of options and process. Made more difficult by the car owner having left Mexico. a) If you chose not to go through the process of removing the car from Aduana’s records, in the future you wish to drive your vehicle to Mexico, you may not qualify to do so as you did not cancel your TIP..
1. Write a letter to the Administracion Central de Operacion Aduanal and give them all your information and explanation of events. 2. Request Anexos 1, 4, 5 and 7. Each of these Anexos require a lot of writing and formal requests. Pls. see below. 3. You'll need a copy of the authorization to destroy the vehicle's remains issued by the competent customs office. In addition, provide a copy of the accident report validating the destruction of the vehicle by Aduana. 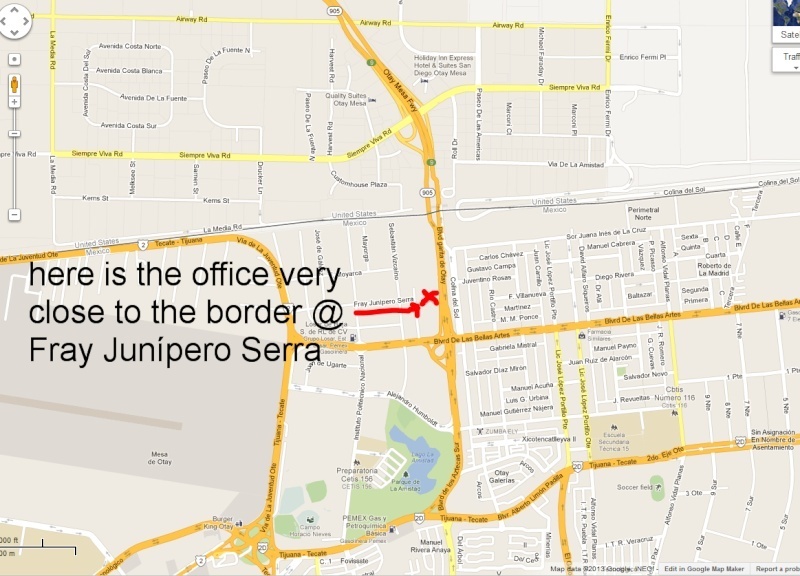 The Aduana office will be the one closest to the place where the accident took place. 4. You will need a copy of the original TIP along with the sticker you placed on the vehicle's windshield. if you cannot provide such documents along with the sticker, you must submit a letter explaining why you are unable to do so. Anexo 4: is the accident report, it must be presented to the closest Aduana where the accident happened. Once they clear it you must obtain a copy from them. Anexo 5: is the authorization and request to destroy the remains of the vehicle. This is important because the authority is issuing you their approval. Anexo 7: request to cancel the TIP. Here you must send the original TIP along with the sticker. Courier service is required to send documents to: Avenida Hidalgo # 77, Modulo 4 1er piso, Colonia Guerrero, Delegacion Cuauhtemoc, Codigo Postal 06300, Mexico DF. After you mail all the documents, you must call them within a few days to confirm they have received the information. Recommendation: you may not want to go through this process as it is so much work and so many step. That means you don't drive a vehicle in your name into Mexico again. Or, you may trailer out the vehicle to the border. In the evolving story of how Aduana/Banjercito are adjusting their official policies on temporarily imported foreign-plated cars (TIP vehicles) to accommodate the Nov.8 2012 INM changes, the central Aduana office for TIPs in DF is now rejecting TIP extensions for WORKING Residente Temporal card holders. Aduana DF has ruled (both in writing and on phone calls) that Residente Temporal Lucrativa permit holders are equivalent to the old FM2 Inmigrante Lucrativa , and hence are not allowed to keep their TIP cars. 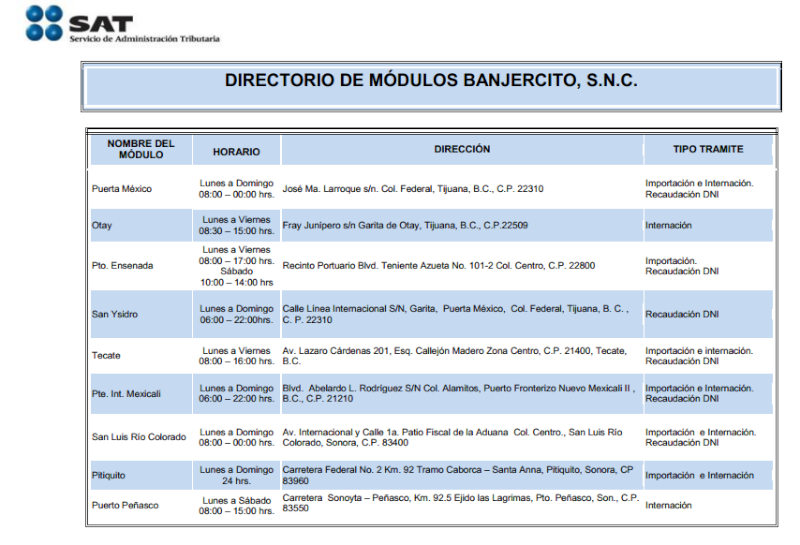 When expats get their Resident Temporal card with permission to work, their TIP vehicle ( Permiso de Importación Temporal de Vehiculo ) becomes immediately illegal and must be taken out of Mexico. 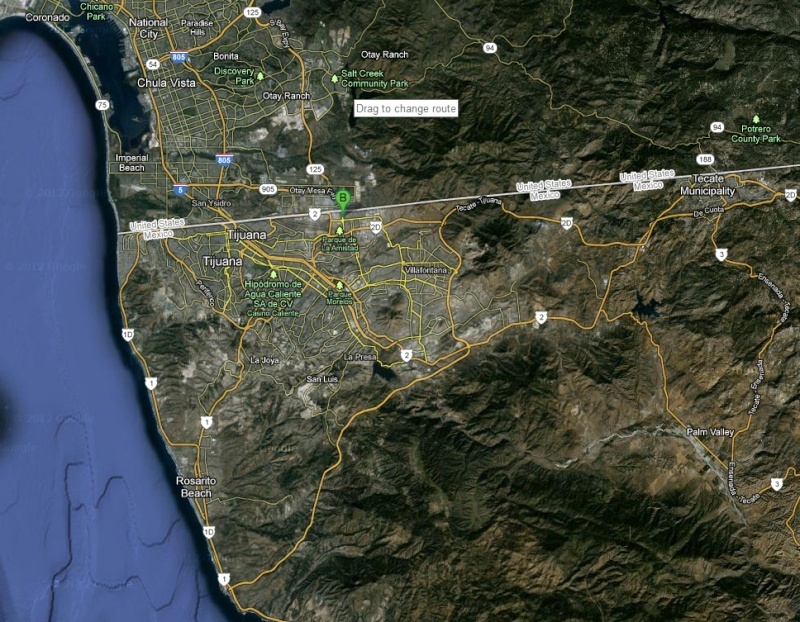 here are the locations but I can not tell if accurate, The one in SanYsidro was not there. and it shows all do not perform all services. but they do have the operating times. These are for all of Mexico, though I am just listing the west ones. Fray Junípero Serra S/N, Garita de Otay, Mpio. Tijuana, B.C., C.P. 22509. From Monday to Saturday 08:00 to 23:00 hrs. and Sundays from 08:00 to 20:00 hrs. It appears you can get in easily if crossing from the USA. 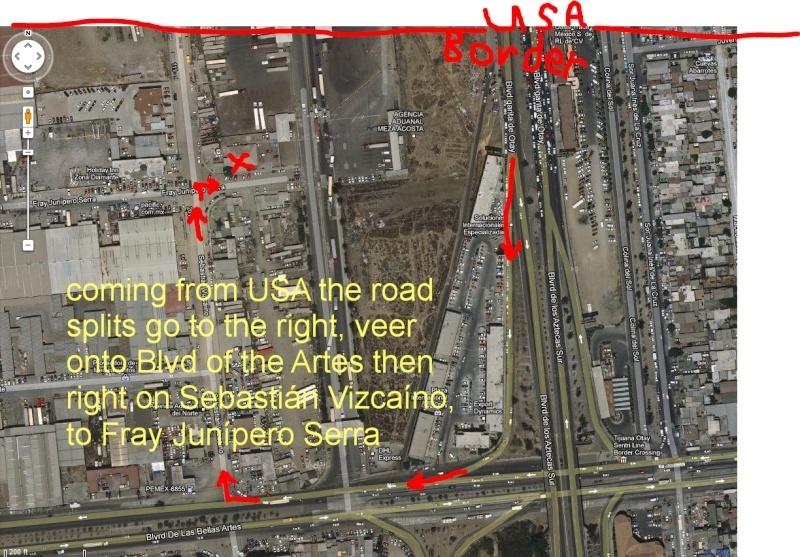 And looks like only westbound from Blvd Bellas Artes can you get in if coming from mexico, the nearest cross street (overpass) does not have a exit to west Bellas artes. 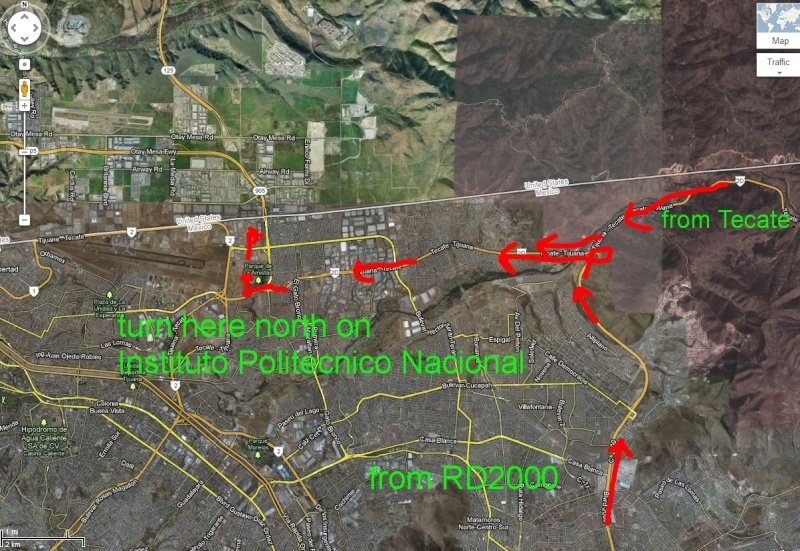 if coming from Tecate or rd2000 this is how you would do it. 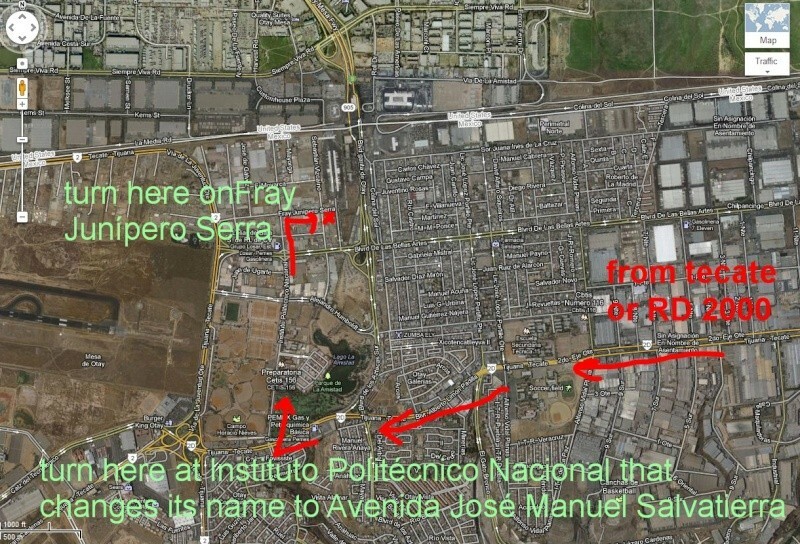 Note that when you turn right on Instituto Politécnico Nacional as you pass Avenue of the artes the road name changes to Avenida José Manuel Salvatierra, keep going straight and turn right on Fray Junípero Serra keep going, till you hit the intersection of Sebastián Vizcaíno, go to the building on the left. 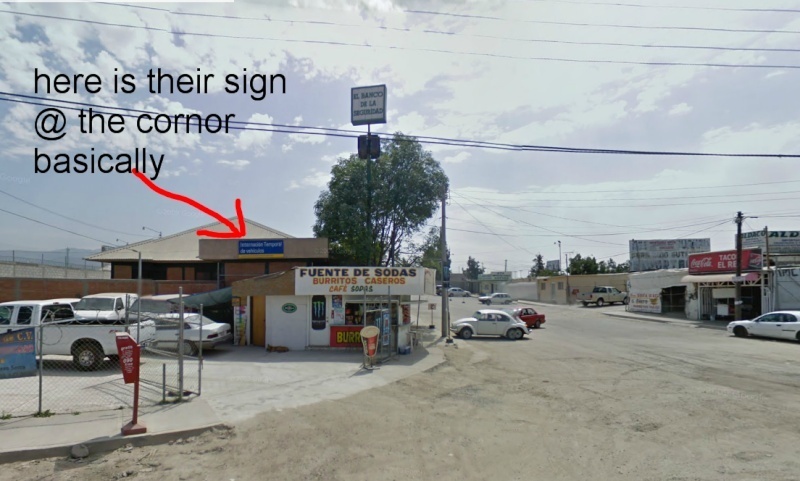 here is the office from google maps @ the intersection of Fray Junípero Serra and Sebastián Vizcaíno, the picture of the area may have changed but the office is right at this intersection. Cars and pickups (no dually’s) can be either permanently or temporarily imported by expats with FMM’s, FM3′s, and FM2-Rentista’s. The vehicle must be exactly 10 years old to be permanently imported (tramited / “nationalized”), see “Importing Used Autos”“, but temporary permits are issued to FMM, FM3 (No Inmigrante), and FM2-Rentista (Inmigrante Rentista) visa holders. Temporary permitted vehicles must be returned at the end of the visa’s period, or the car can be confiscated by Mexican officials. Vistor’s FMM’s and hence their temporary permits are for 180 days, while vehicles temporarily imported under FM3′s and some FM2′s are allowed to stay in Mexico as long as the visa remains valid. The owner of the vehicle must stop at Aduana offices at the border to have them remove the import-sticker whenever the vehicle leaves Mexico. Article 106 allows foreigners to temporarily import a car into Mexico for the duration of the registered importer’s immigration status: e.g. 180 day FMM visa gives 180 days for their car; FM3 & FM2 holders have the 365 days for their car (plus any extensions or re-applications). The car import sticker is valid as long as the holder’s Visa remains valid, regardless of the expiration date shown on the import sticker. FM3 period = Vehicle’s approved period. As long as you made your original deposit with a Credit Card, there is no requirement for the driver to go to a border crossing / car permit office to renew it, because it is automatically renewed when you renew your FM2 or FM3. 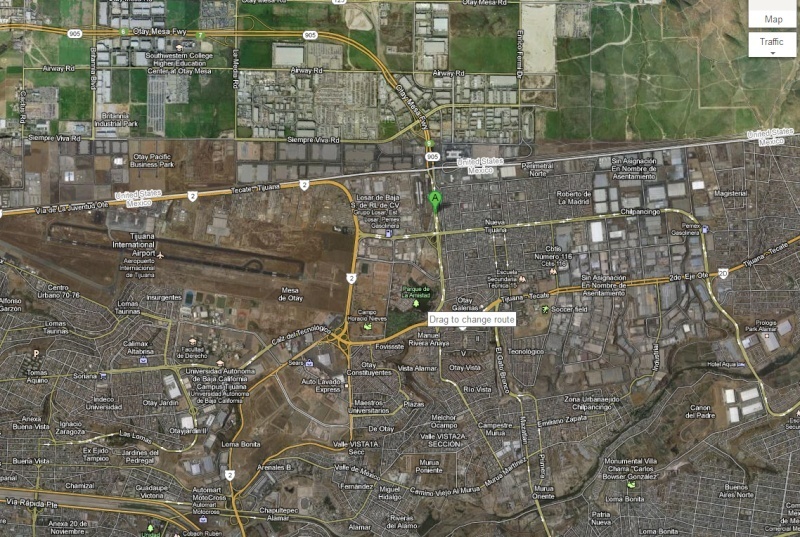 If you need to get or remove a temporary import sticker in TJ here is the location at San Ysirdo the main TJ crossing.